In 1967 four members of the British rock band Pearl Harbour, die within days of each other but in different ways and at different locations; consequently the deaths are not connected and not seen as suspicious. In the present day an unknown man is involved in an accident in Brussels and after being unconscious, suffers with locked-in syndrome. They name him X Midi, after the station his accident occurred. An Irish journalist decides the deaths in 1967 are suspicious and gets involved with the present-day accident victim telling his story in flashback. It is really well written, with flowing short chapters. The author has done an excellent job of keeping the reader wondering how these two threads will come together and he wrapped it all up well. The books draws heavily on the music and I suspect the author is a huge fan such was the depth of knowledge displayed. Locked-in syndrome is becoming increasingly popular in crime books these days, but I felt this author dealt with it incredibly well., much better than others that I have read. I’m not a fan of the music of that era and the associated drugs scene is not something I enjoy reading about. However, I was drawn in from the first page and thoroughly enjoyed the book. 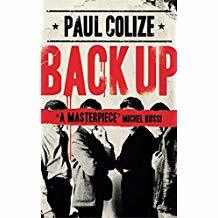 It is a must for anyone who loves the music of that period and it will appeal to anyone who enjoys a good thriller which brings something different to the genre. Credit to the translator Louise Rogers Lalaurie.